Add on Temp and Amp gauges? 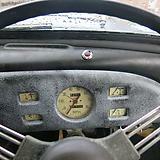 My 1952 MM has an ammeter and temperature gauge mounted under the center of the dashboard. I always thought they were original. Not so? Re: Add on Temp and Amp gauges? So has mine, but I put them there. Looks good, any chance of a photo with the steering wheel off? Tortron: This photo has been making the rounds in Minor groups ... is it your finished installation? AND, did you use MG Magnette or Standard Vanguard Phase I gauges? More details most welcome!